Sen. Beth Humenik (R) and the boys of the Colorado Senate. One of the most competitive races in Colorado’s state legislature pits a woman who led the charge to expose a culture of sexual harassment at the Capitol against a woman who protected an alleged perpetrator of that harassment from expulsion. Democratic State Rep. Faith Winter is vying for the Adams County seat that’s currently occupied by State Sen. Republican Beth Martinez Humenik, and how voters are reacting to the #MeToo movement could be a decisive factor in the outcome of the race, which could determine whether Democrats gain control of state government. Winter led the charge to expose rampant sexual misconduct at Colorado’s Capitol after she publicly accused Steve Lebsock, a fellow Democratic state lawmaker, of sexually harassing her. After Winter came forward, several other women brought similar allegations against Lebsock, leading to his expulsion from the state’s House of Representatives. Lebsock was expelled with the support of many Republican lawmakers. But when it came time to consider the expulsion of an alleged serial sexual harasser within their own party, Republicans in the state Senate, including Humenik, protected their own. Republican State Sen. Randy Baumgardner of Hot Sulfur Springs was accused of harassing several women at the capitol, including groping them and making unwanted sexual comments. 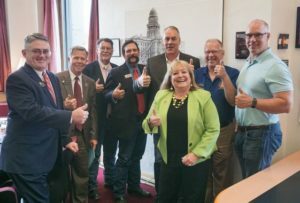 Despite the fact that the allegations were found to be credible by a third-party investigation, a resolution to expel Baumgardner failed, with only one Republican state senator voting in favor of the expulsion. Humenik voted to keep Baumgardner in the Senate. Humenik didn’t return an email requesting an explanation for her vote. But in her only recorded comments on the matter, she pivots away from talking about the harassment claims against Baumgardner to highlight how a Democratic lawmaker once used the women’s restroom. “I am beyond confused why they are so quick to leap to judgment and calls for resignation when just last session we couldn’t keep one of their male members out of the women’s restroom,” Humenik told Colorado Public Radio. She’s referring to the complaint she filed alleging that State Sen. Daniel Kagan, a Democrat, used the women’s restroom. At the time, the restroom in question was unmarked and sat directly across from the men’s restroom, which was also unmarked. Kagan admitted that he mistakenly used the wrong unmarked restroom in 2017. Still, the subsequent investigation cost Colorado $8,000. “Women must be able to feel comfortable and safe in their workplace environment,” Humenik told Colorado Public Radio after the investigation concluded. Humenik’s complaint was filed in March, just before her early April vote not to expel Baumgardner. Humenik is one of only two female Republican state Senators, both of whom voted to protect Baumgardner from expulsion. This post originally appeared on the Colorado Times Recorder. Beth Martinez-Humenik didn't even have the brains and/or moral principles that Ray Scott had when he voted to remove the Stache. That says a great deal when Ray Scott looks better than someone.